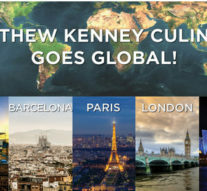 Matthew Kenney Culinary is proud to announce International Academy expansion. Throughout 2017 Matthew Kenney Culinary will premier across the globe from the city that never sleeps, to the city of lights and all the way to Australia’s largest city, Sydney. The expansion also includes London and Barcelona where students will explore plant-based desserts, Culinary Nutrition and Level 4: The Future of Food. Matthew Kenney Culinary is excited to expand in a time when international demand for plant-based education is high. Please click on the name of each location to download more information!! Contact me today for any questions!